It was 1129 when Giuditta Sanbonifacio transferred her Concadalbero Court properties to the abbot of Padua’s Monastery of Santa Giustina. In this precarious and wide land, the monks boosted an astonishing millenary reclamation work along with a carefully planned territory management, which gave birth to a rationally cultivated, well-organised and fertile land. At the beginning of XIV Century, the monks moved the administration centre from Concadalbero to Correzzola. Here, at the back of a bend of River Bacchiglione – an essential waterway for goods transportation also called “Via del Sale” (“Salt way”) – the monks built the majestic Benedictine Court, described by Paduan historian Andrea Gloria as “the biggest rural complex in Lombardia and Veneto”. The very core of the Court was built between 1430 and 1450, while the last relevant addition to the building was planned between the end of 1500 and the first years of the following century, as a consequence to the decision of furnishing the Court with an abbey room and guest quarters. Furthermore, it was also decided to raise the building by a storey (for a total of three storeys), thus creating the level called “mezzanine”. 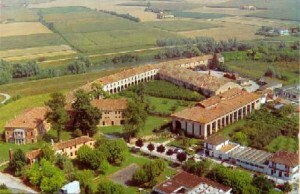 Despite the huge dimensions of the Court, the number of monks was always low: on average, only a ten of them steadily lived in the complex, as the Court was not a religious centre, but it was the “big factory of Santa Giustina Benedictine Order” as someone once defined it, so its commercial, farming and strategic functions prevailed over the religious. The monks built about ninety brickwork farmhouses with pantile roofs that were particularly comfortable compared to the thatched cottages popular in those days. All farmhouses were named after a Saint, whose portrayal was kept on the wall of the arcade. Among these buildings, the most important and even the most original from an architectural standpoint certainly was the “Grande Vanezza”, the second most important centre after the Court. It was built on the altimetrically highest point of all the surrounding lands to facilitate cattle breeding. Monastic farms were built with the purpose of satisfying all farming, stockpiling and processing needs of crops: each farmhouse was made of a living unit, a rural portion with a hayloft and a long arcade. The buildings were designed to have their façade turned to the South, and all of them had a wide farmyard called “sèese” which was used to stock and dry harvested crops. However, Correzzola Benedictine monks’ true revolution consisted of a relevant improvement on territorial management: they divided the property in five “gastaldie” (royal demesne) which corresponded to today’s municipality hamlets. Each royal demesne was given to a gastald, who usually was a person trusted by the Monastery, and was further split into smaller portions, which were let out to tenant farmers living in the farmhouses. Territorial water system management was always carefully carried out: two cellarer monks, one in charge of sowing and harvesting and the other in charge of lands reclamation, planned and supervised the work. The territory was then supplied with a Benedictine road system, complemented by reclamation channels’ banks that still cover the area lengthwise. This long story of wise Benedictine management on the area ended during the spring of 1797 at the hands of Napoleon, who short after (in 1807) appointed Francesco Melzi d’Eril Duke of Lodi and donated him Correzzola’s large landed estate. Therefore, the Court and its vast lands became property of the Lombard family, which managed it until 7 October 1919, when duchess Joséphine started selling portions of the large landed estate to the resident farmers in order to be able to retire in Milan, where she died in 1923 at the age of 93. 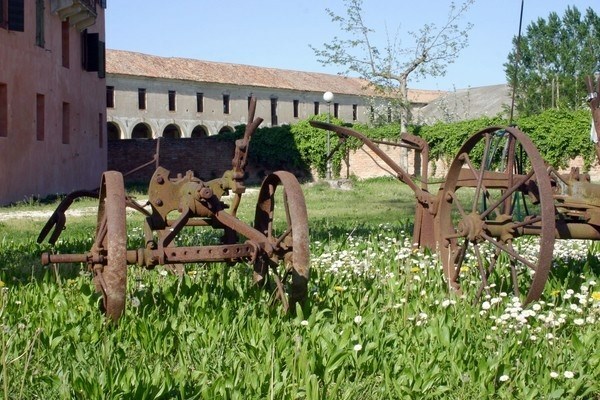 Melzi d’Eril’s family carried on Benedictine monks’ reclamation work by building big draining pumps; they also altered the Benedictine Court from a stylistic point of view to better accommodate it to their aristocratic status whilst still preserving its core architecture. Nowadays a portion of the Court belongs to the municipal district, while private citizens own the other. After restoration works for the municipal district portion were completed in 1999, one wing of the Court has been used as back office, while another wing was transformed into a welcoming Bed & Breakfast called “La Corte”. Guided tours on foot, by bike or on horseback were worked out on safe routes not congested by cars, so that tourists can enjoy the verdant landscape and the numerous streams in tranquillity. 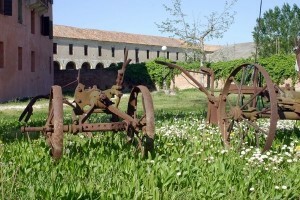 During these tours, tourists can also sightsee the most interesting Benedictine farmhouses, which is a unique opportunity to admire a landscape that still recalls an evocative rural tradition. Thanks to its closeness to naturalistic locations like Delta del Po’ Park, Euganean Hills Park, Venice lagoon and Veneto coast, the Court is also a perfect starting point for excursions. Daily trips to close minor and major cities of art like Padua, Vicenza, Chioggia, Este, Montagnana and Arquà Petrarca are available too.